The Phizzing Tub...: Oh Mom!!!! Spencer (my back seat driver) screamed those words to me while I was driving earlier today. Talk about being scared out of your mind. As soon as he said," turtle", I had noticed the little creature slowly creeping out from the side of the road. I swerved quickly to the left and then back to the right. Now, I should not have been going a wee bit over the speed limit (you did not really read that part) because the poor van felt like I was putting it through a slalom test at high speed. They just saw this woman, zig, zagging all over the place. The boys were chuckling and my heart was pounding. Ugh! What a scare, great way to make sure your heart is working. The turtle was saved and the person behind me also swerved. Upon our return home, I made sure to look and the turtle was nowhere in sight. 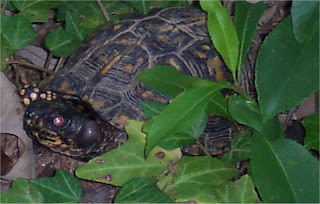 ** The turtle above was one that made a home in our ivy a few years ago. Pretty serious encounter. Glad to hear you guys are okay. Yes, we are all fine.